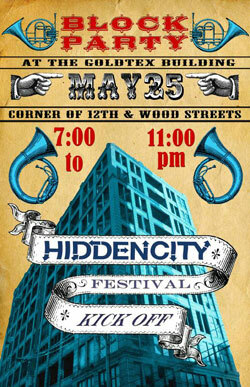 The Hidden City Festival 2013 will kick-off this year with a block party at the Goldtex Building, located at 12th & Wood Streets on May 25 from 7-11 p.m. The evening features live music and a dance party under the Reading Viaduct, starring Hank & Cupcakes, City Rain, DJ Adrian Hardy, DJ Lina Luv, and the New Sound Brass Band. Gourmet eats from local food trucks and craft beer will be sold on site. Join Hidden City in previewing this year's exciting lineup of Festival sites and artists, purchase your Festival passes, and learn more about Hidden City Philadelphia. Tickets are $10 for advanced purchase and $15 at the door. All proceeds benefit the Hidden City Philadelphia Festival 2013. To purchase tickets visit hiddencityphila.ticketleap.com/kickoff or learn more about the Festival at festival.hiddencityphila.org.